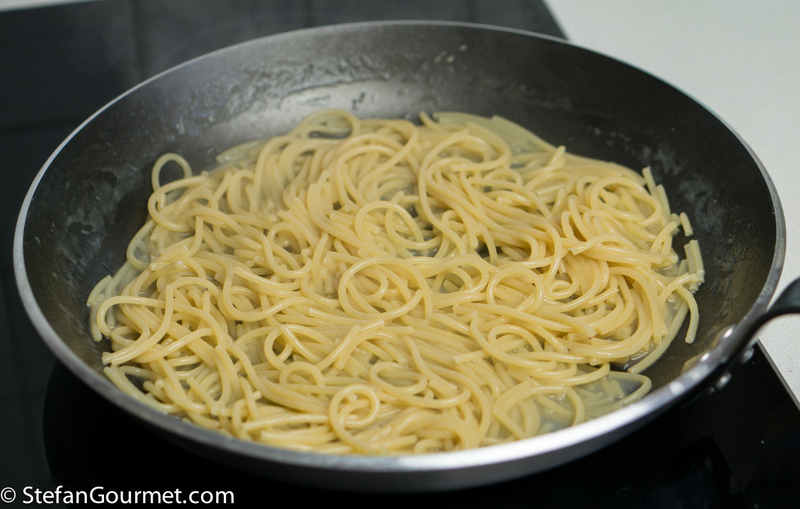 Many Italian pasta recipes will tell you to cook the pasta for a couple of minutes less than the time indicated on the package for al dente (which by the way is pronounced “al DENtuh” instead of “al denTAY”), and then finish cooking the pasta in the sauce. This technique “marries” the flavors and will make sure that all the pasta is covered with sauce. (This is also why the quality of pasta is measured, among other things, by how well a sauce adheres to it.) Pasta and sauce are usually served already mixed, not separate. 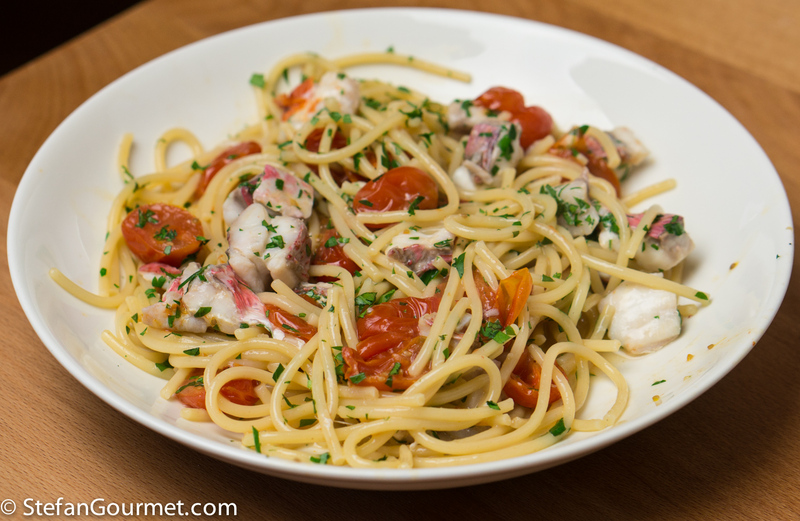 If you mix the pasta with the sauce on your plate, it will cool off, it will be messy, and it won’t be mixed as well. 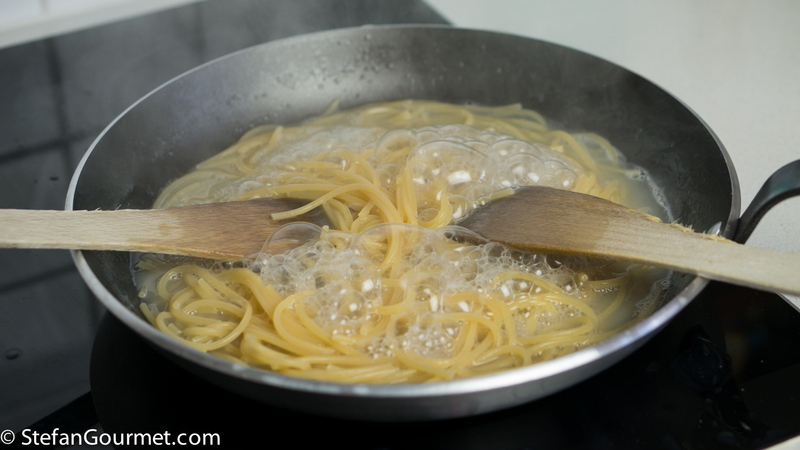 The pasta may also clog together if you keep it too long without a sauce. A technique that takes finishing cooking the pasta in the sauce one step further, is pasta “risottata”, or pasta cooked in the way of risotto. 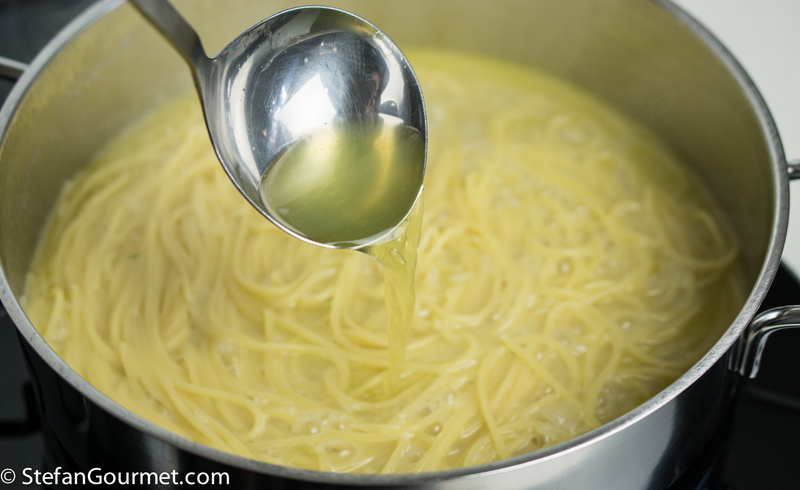 This means that the pasta is cooked in stock from the start, and more stock is added as needed during the cooking process. My blogging friend Bea is an advocate of this technique, and she published many recipes that use it on her blog Viaggiando con Bea. It has the same advantages of finishing to cook the pasta in the sauce, but it makes the sauce more creamy and the flavors marry even more. 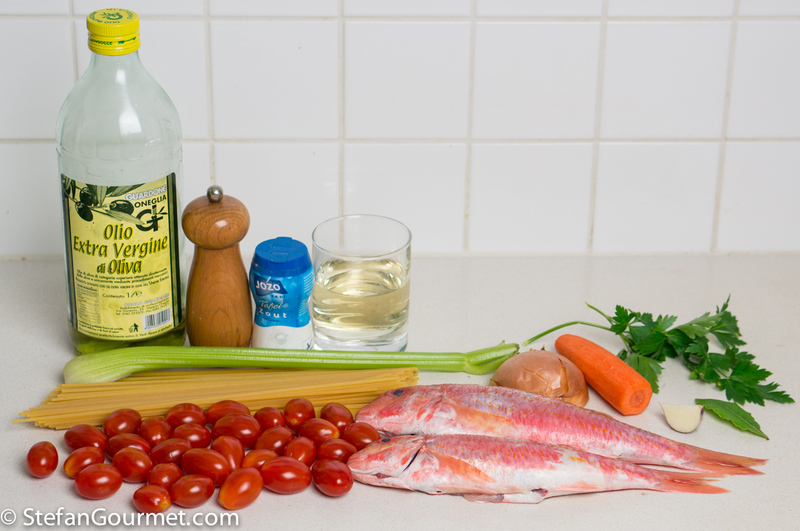 To try the technique of spaghetti risottati, I prepared an adapted version of Spaghetti all’Aqua Pazza, spaghetti with fish and tomatoes. The main differences are that more stock is needed, and that the pasta is cooked only in the stock. The result was very nice, with a creamier sauce and a stronger flavor from the fish stock. 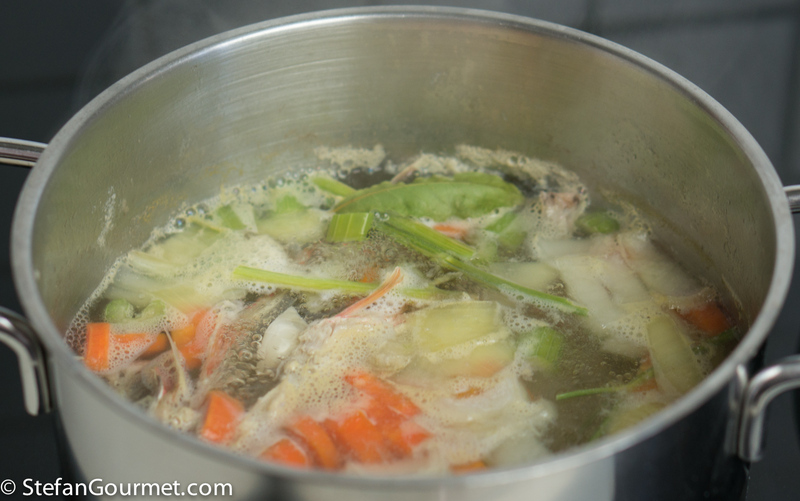 Start by making the fish stock. Soak the heads and bones in cold water to remove any traces of blood and ‘off’ odours. 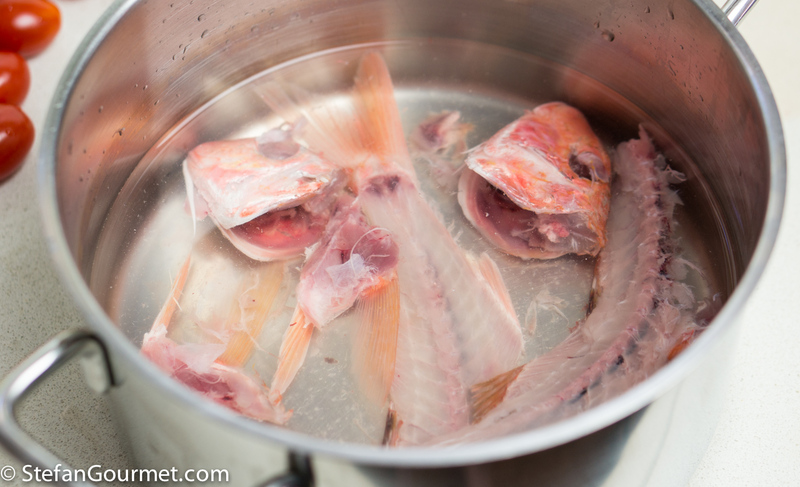 Then put the heads and bones in a pot and cover with a litre (quart) of cold water. Bring to a boil and remove the scum that will rise to the surface. Add the carrot, celery, onion, and bay leaf. 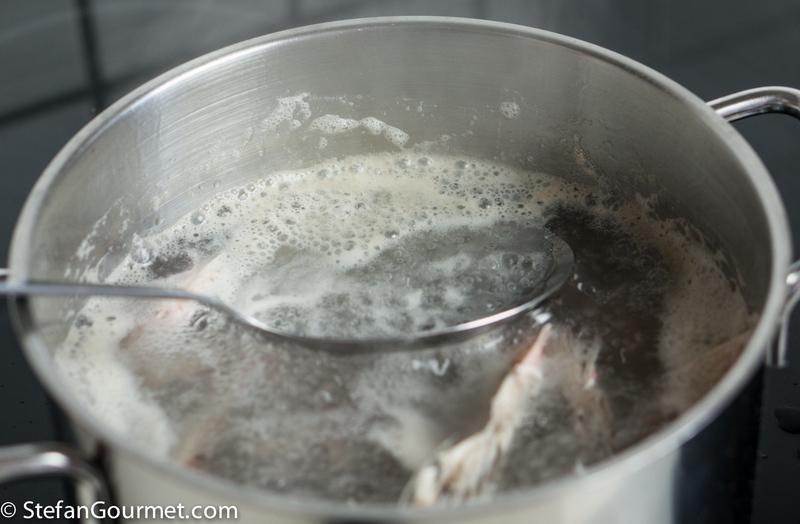 Reduce the heat to a simmer and simmer for 30 minutes. 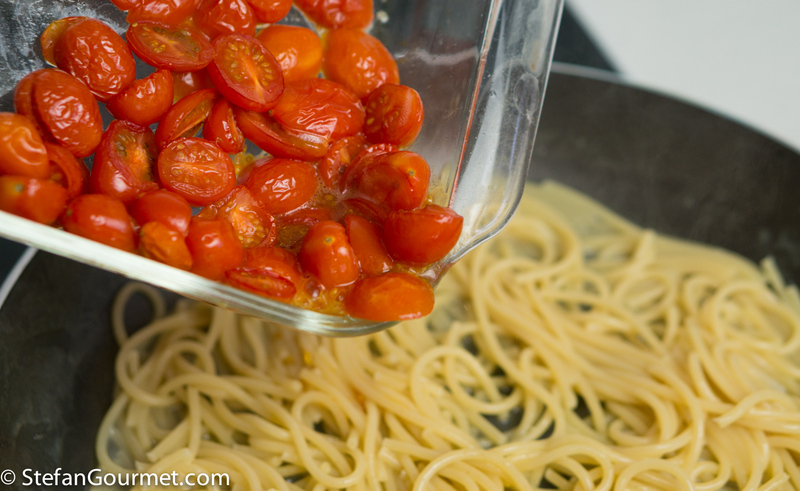 Meanwhile, cut the cherry tomatoes in half, put them in a baking dish and toss them with a tablespoon of olive oil. Bake them for half an hour in the oven at 175C/350F. 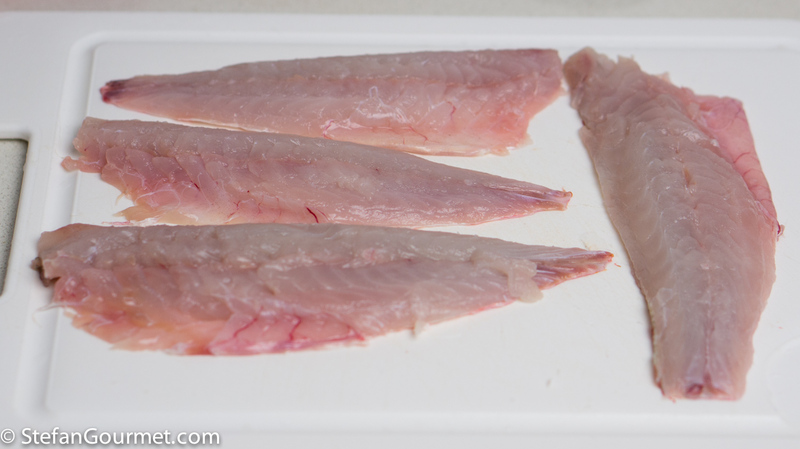 Rinse the fish fillets with cold water and pat them dry with paper towels, then season them with salt. 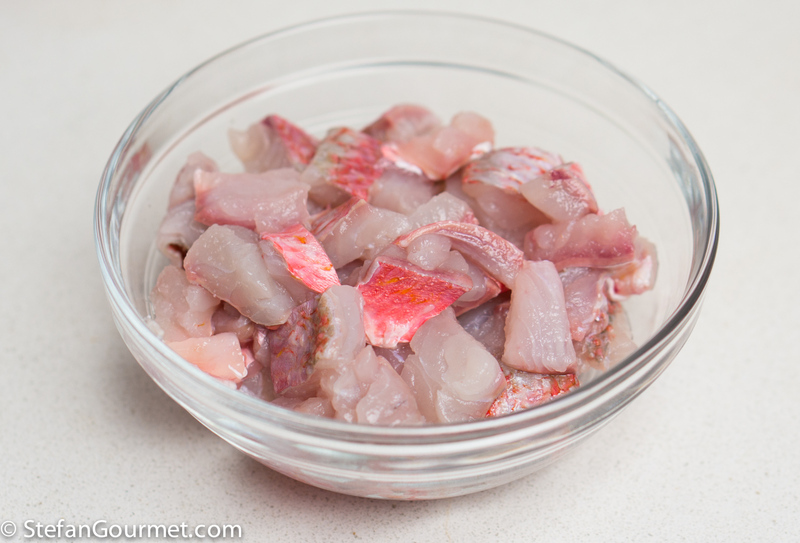 Cut the fish into bite-size pieces and refrigerate until needed. After half an hour of simmering, the fish stock will be done. 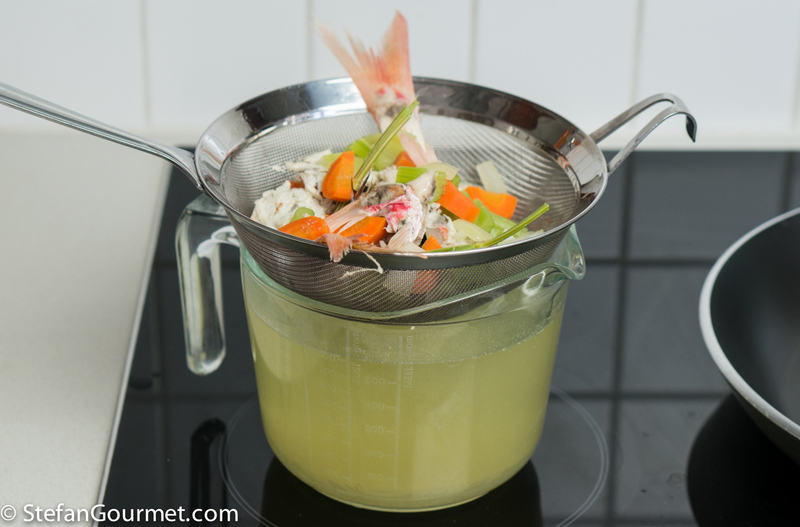 Filter the fish stock with a fine sieve. 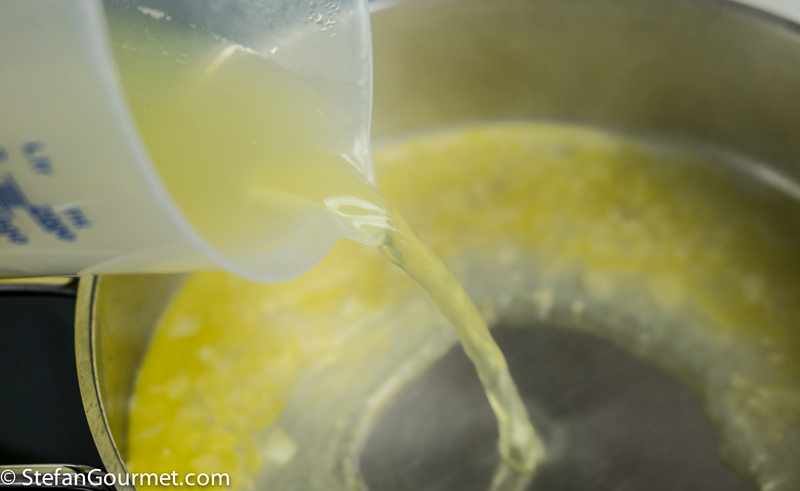 Heat a tablespoon of olive oil in a frying pan. 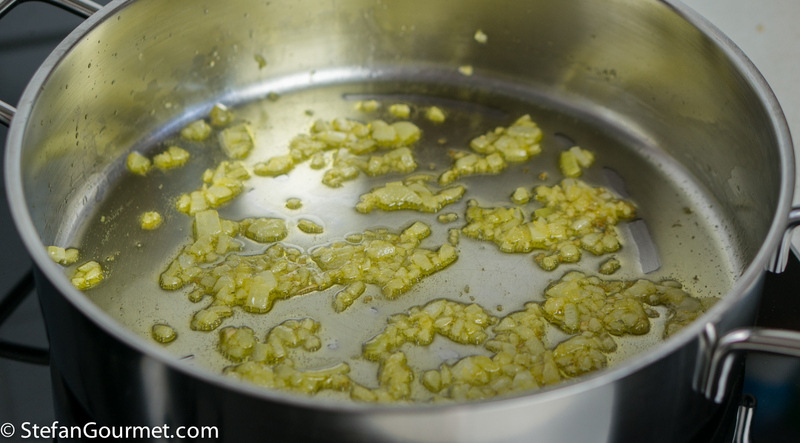 Add a minced shallot and a minced garlic clove and stir them for a minute over medium heat. Do not allow the garlic to color. 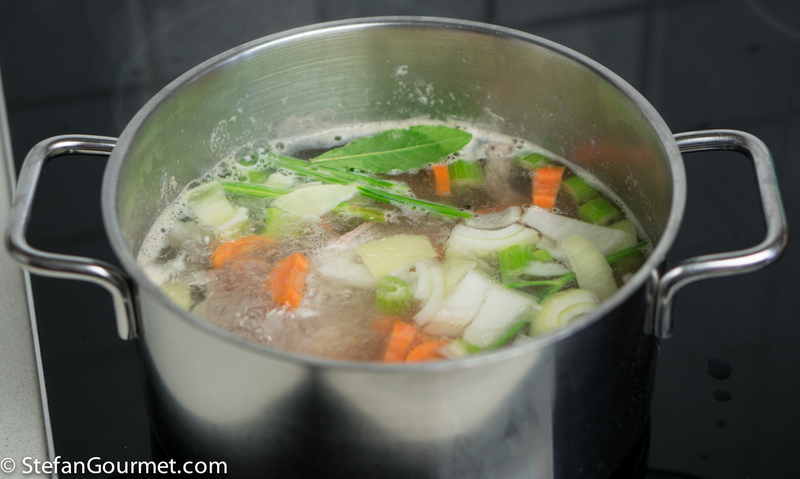 Add about half a liter (2 cups) of the fish stock and bring to a boil. Season with salt. 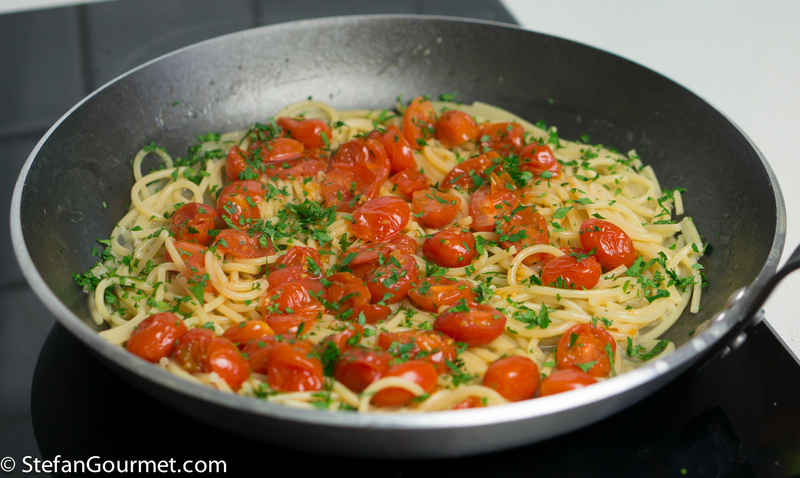 Once the spaghetti is almost cooked, add the baked cherry tomatoes including the juices from the oven dish. 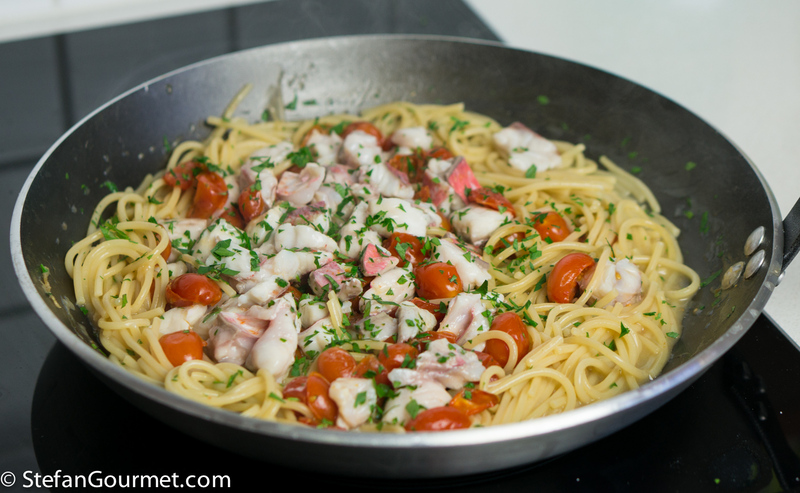 Add the parsley as well and gently stir, without breaking up the tomatoes. Turn off the heat. 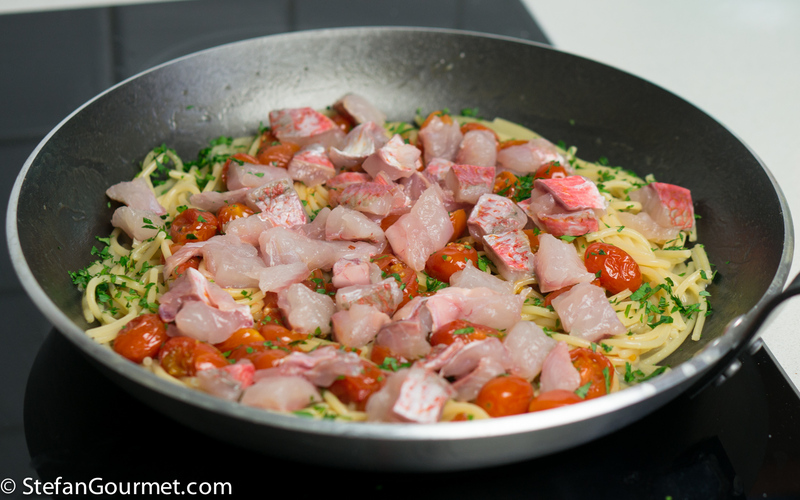 Cover the pan and allow the fish to cook in the heat of the pasta. This will only take a couple of minutes. Once the fish has turned white, it is cooked. Stir very gently so the fish and the tomatoes will stay in tact. Season to taste with salt and freshly ground black pepper. What’s fishy about this post? 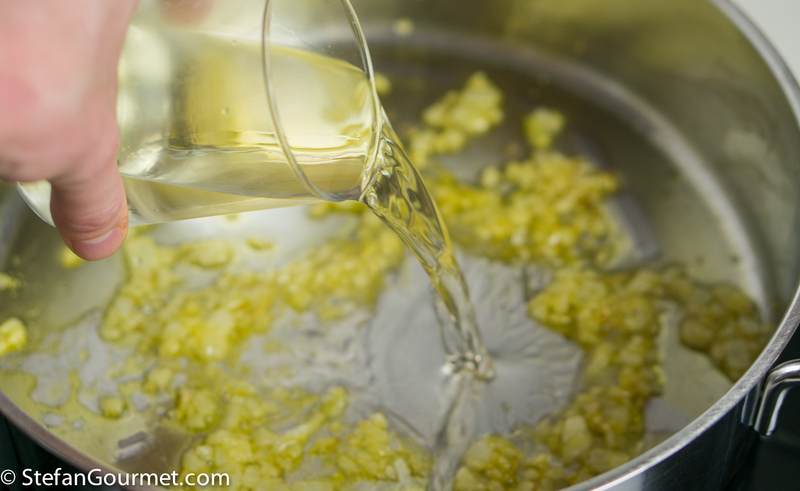 If you paid close attention to the photos, you probably noticed that I used two different pans. 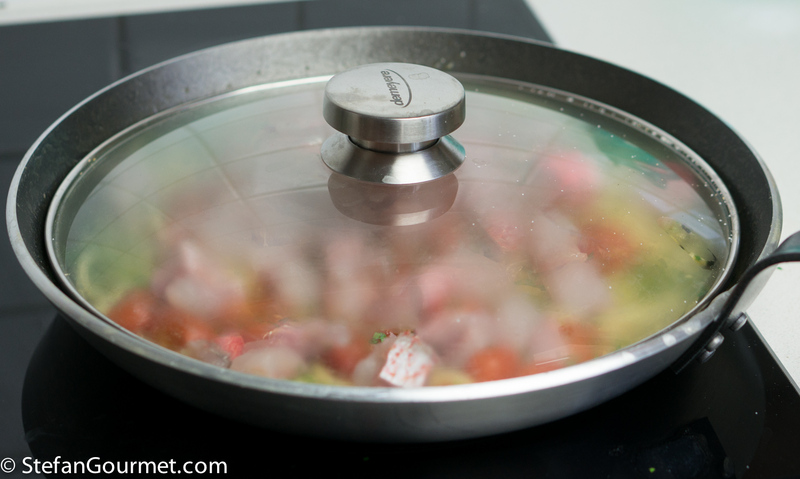 The photos start with a silver-colored pan, and end with a black non-stick pan. This is because my first attempt at making this dish, in a non-stick pan, didn’t go so well. I did not add enough stock in the beginning and the heat distribution of the pan was not good enough, so I had to use high heat and a lot of stirring to keep it boiling. This photo shows what happened: the spaghetti broke up into short pieces. When I made the dish for the second time, I corrected my mistakes and used a better pan with great heat distribution, more stock in the beginning, and more gentle stirring. 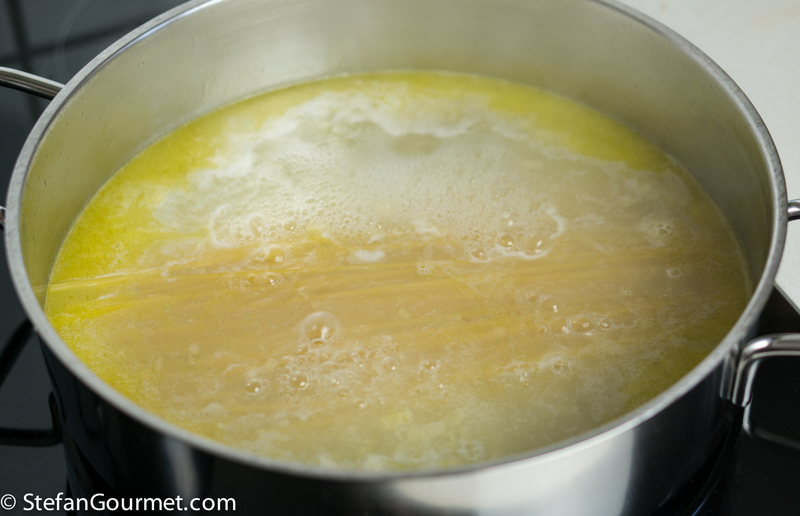 If you use enough stock and stir gently often enough, non-stick is not needed. I did not take photos of all the steps again, so for this post I ended up combining photos from the two sessions. That is what’s “fishy” about this post, other than the use of red mullet. 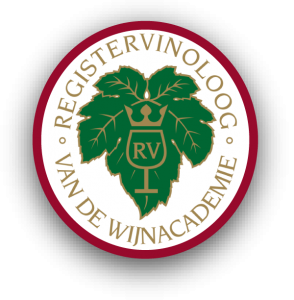 The herb “savory” is called “bonenkruid” (bean herb) in Dutch, which indicates it goes well with beans. 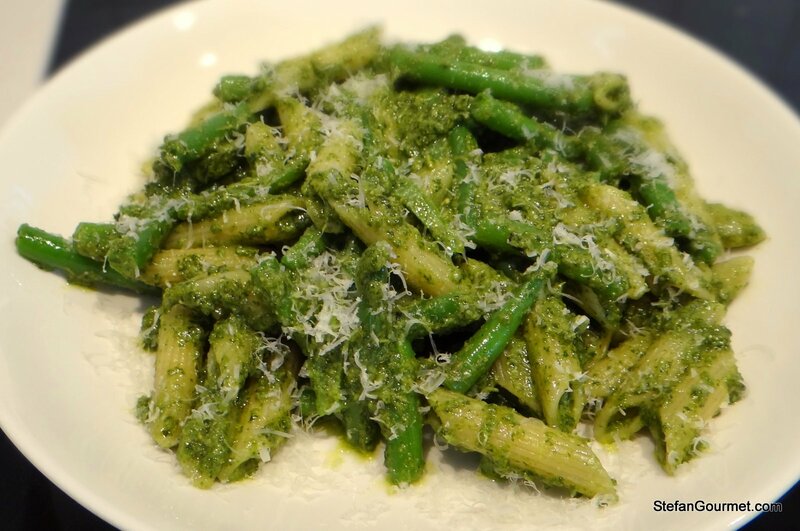 This is true, as this pasta with green beans and savory pesto clearly demonstrates. Brilliant! Have never cooked pasta in risotto-style and am just sorry that dinner is over ’cause now I am curious 🙂 ! Tomorrow! Seems to me that it would be even easier to hit the ‘al dente’ mark with this methodology . . . But now I shall shock you: No knife, no spoon, but no fork either – this gal, at least when she is on her own, eats all her pasta dishes with chopsticks!! Well, most of my pasta happens to be Asian also !!! Hate to tell you in the nicest possible way that I somehow manage to do that a wee bit too often anyways 🙂 ! So di questa felice abitudine di Bea di cucinare la pasta risottata, io non ho ancora provato… ma non cucino risottato nemmeno il risotto!! Anche tu cedi alle “tendenze”! I never would have caught that! This is a very interesting technique. Love the simplicity of the dish – and the mullets are belissimo! Le triglie sono belissime — female plural (singular: la triglia). I used to be fluent in French but I still can’t remember gender! I’ll now remember that Italian fish are girls! Not all fish are girls. Mackerel is sgombro, tuna is tonno. But many I can think of right now are indeed female: sogliola, acciuga, gallina. Fish itself is male: il pesce. see? that’s why I can’t remember French la or le. and now my brain is too old!!! Beautiful dish and you caught me on that one! I didn’t notice the switch in pans either.